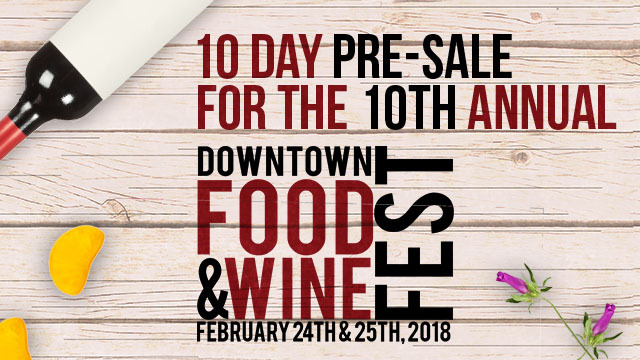 Located in the heart of downtown Orlando at Lake Eola on Robinson Street, the 10th Annual Downtown Food & Wine Fest features mouth-watering dishes from over 30 of Orlando's premier restaurants, 50 domestic and international wines, and live entertainment. The tradition continues as Orlando foodies and wine lovers experience unique local cuisine paired with wines from around the globe at the 10th Annual Downtown Food & Wine Fest! Located in the heart of downtown Orlando at Lake Eola on Robinson Street, the two-day Fest features mouth-watering dishes from 30 of Orlando’s premier restaurants, domestic and international wines, and live entertainment that includes local and national performers. Visit www.DowntownFoodandWineFest.com for more information. 10 day pre-sale includes $15 General Admission Tickets and $30 General Admission Ticket+ Wine Taster's Club Lanyard. Offer only valid 1/16/18 - 1/25/18. Pre-sale savings end on 1/26/18 from $15 to $18 for pre purchsed online sales only. General Admission Ticket prices will rise increase on the day of the event so purchase early online to save! Food & Beverage tickets sold separately inside the event. The Fest is presented and produced by Entercom, led by Orlando favorites Mix 105.1, 1059 SUNNY FM, and FM 101.9 Radio. The Downtown Food & Wine Fest is a rain or shine event. Tickets are non refundable and have no cash value.